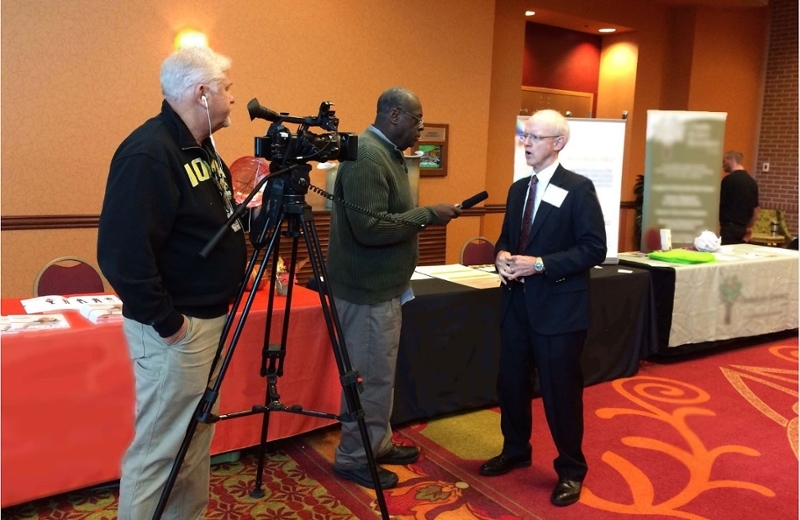 *Dr. John Bertoni is interviewed by WOWT News at the 26th Annual "Living Better with Parkinson Disease" symposium. October 2016: The award of Dr. Matthew Rizzo's IDeA-CTR grant is covered in the Omaha World Herald. The grant, which is the largest ever received by UNMC, will create the Great Plains IDeA-CTR Network, a collaboration involving nine institutions in Nebraska, North Dakota, South Dakota, and Kansas. October 2016: KETV News interviews Dr. Danish Bhatti and Dr. John Bertoni about the Department of Neurological Sciences' "Living Better with Parkinson Disease in 2016" symposium. More than 500 members of the Parkinson's community attended the highly successful event. October 2016: WOWT News covers the Department of Neurological Sciences' "Living Better with Parkinson Disease in 2016" symposium. This was the 26th annual conference and the largest yet. October 2016: Dr. Matthew Rizzo's groundbreaking new IDeA-CTR grant is covered in the Lincoln Journal Star. October 2016: Dr. Matthew Rizzo is interviewed by KETV News about the IDeA-CTR grant. October 2016: Dr. Jennifer Larsen, Vice Chancellor for Research, is interviewed by KNOP News about Dr. Matthew Rizzo's IDeA-CTR grant. October 2016: Dr. Matthew Rizzo's IDeA-CTR grant is covered by KGIN News. September 2016: Drs. T. Scott Diesing and Marco Gonzalez-Castellon are interviewed by the Omaha World Herald about UNMC's and Nebraska Medicine's innovative new telestroke program. September 2016: Dr. Diego Torres-Russotto's research studies of a rare movement disorder known as Orthostatic Tremor are discussed in the Kenora Daily Miner and News. June 2016: Dr. Diego Torres-Russotto discusses Parkinson's disease with Health.com. May 2016: Dr. Tony Wilson and Dr. Daniel Murman discuss new Alzheimer's disease research efforts with the Fremont Tribune. May 2016: Dr. Daniel Murman is interviewed by KMTV on the need to support the caregivers of Alzheimer's disease patients. May 2016: Dr. T. Scott Diesing is interviewed by KETV about Nebraska Medicine's collaborations with the UNO baseball team to help pediatric patients and raise awareness about stroke. May 2016: Dr. Amy Hellman is interviewed by KETV about UNMC's and Nebraska Medicine's Huntington's Disease Center of Excellence. May 2016: Dr. Tony Wilson is interviewed by Columbus News Team on his new study for early detection of Alzheimer's disease. May 2016: Dr. Harris Frankel is interviewed by KIOS Radio 91.5 AM about Nebraska Medicine's inclusion on the "100 Great Hospitals List" for the third year in a row. March 2016: Dr. Daniel Murman is interviewed by KETV about Alzheimer's disease. December 2015: Dr. Matthew Rizzo is interviewed by KVNO News on his use of innovative driving simulators to study neurological health. December 2015: Dr. Amy Hellman is interviewed by WOWT News about UNMC’s and Nebraska Medicine’s new Huntington’s Disease Clinic. December 2015: Dr. Tony Wilson is interviewed by KIOS 91.5 FM on his new imaging study to map adolescent brain development. November 2015: Dr. Matthew Rizzo is interviewed by the Omaha World Herald on UNMC’s and Nebraska Medicine’s innovative new Mind and Brain Health Labs. November 2015: Dr. Matthew Rizzo is interviewed by KMTV on his introduction of the new SENSEI simulator to assess driving capability in patients with neurological challenges. November 2015: Dr. Matthew Rizzo is interviewed by WOWT on his introduction of the new SENSEI simulator to assess driving capacity in patients with neurological challenges. October 2015: Dr. Pierre Fayad is interviewed by the Omaha World Herald on the implications of the SPRINT study for treating high blood pressure. August 2015: Dr. Diego Torres-Russotto is interviewed by The Katy News on his series of research studies on a rare movement disorder known as Orthostatic Tremor. April 2015: Dr. Deepak Madhavan is interviewed by the Omaha World Herald on a bill to allow a clinical trial of cannabidiol for the treatment of intractable seizures. February 2015: Dr. Daniel Murman discusses the NOBLE study for Alzheimer’s treatment with KETV. December 2014: Dr. Daniel Murman is interviewed by KIOS Radio 91.5 AM about the NOBLE study to slow the progression of Alzheimer’s disease. April 2014: Dr. John Bertoni discusses Parkinson disease with Omaha Magazine. January 2014: Dr. Daniel Murman is interviewed by WOWT News about the potential benefit of deep brain stimulation surgery for patients with movement disorders. July 2013: Dr. Tony Wilson is interviewed by the Lincoln Journal Star on his work using magnetoencephalography (MEG) imaging to map the areas of the brain affected by Parkinson disease. April 2013: Dr. Tony Wilson is interviewed by the Scottsbluff Star Herald on his research study to map the effects of aging on cognition in patients with HIV. April 2013: Dr. Rana Zabad discusses multiple sclerosis on the Good Morning Show. February 2013: Dr. Daniel Murman discusses Alzheimer’s disease with Omaha Magazine. January 2013: Dr. Deepak Madhavan discusses the role of a ketogenic diet in the treatment of epilepsy with the Omaha World Herald. October 2012: Dr. Diego Torres-Russotto is interviewed by WOWT on his new research study of a rare disorder known as Orthostatic Tremor. October 2012: Dr. Diego Torres is interviewed by KETV on his new research study of a rare disorder known as Orthostatic Tremor. August 2012: Dr. Pierre Fayad is interviewed by CNN on whether chocolate can lower men’s stroke risk. June 2012: Dr. Pierre Fayad is interviewed by KETV on pediatric strokes. Be sure not to miss Dr. Daniel Murman's presentation on NET Nebraska's "Now What?" series discussing dementia, delirium, and depression in Alzheimer's patients. NET Nebraska is Nebraska's PBS & NPR stations affiliate.